Visiting the Boboli Gardens in Florence. Between Palazzo Pitti, Forte Belvedere, and Porta Romana, Boboli Gardens are among the grandest and most elegant of Italian-style gardens. Natural architectural backdrops render it an extraordinary open-air museum. Boboli was built over four centuries from the 15th to the 19th century. The vegetable gardens behind Santa Felicita in the Oltrarno of the Borgolo family (possibly the origins of the name Boboli) were bought in 1418 by Luca Pitti. Around the mid 15th century, Luca Pitti commissioned the palace’s construction, likely on Luca Fancelli’s design who involved his teacher Filippo Brunelleschi. 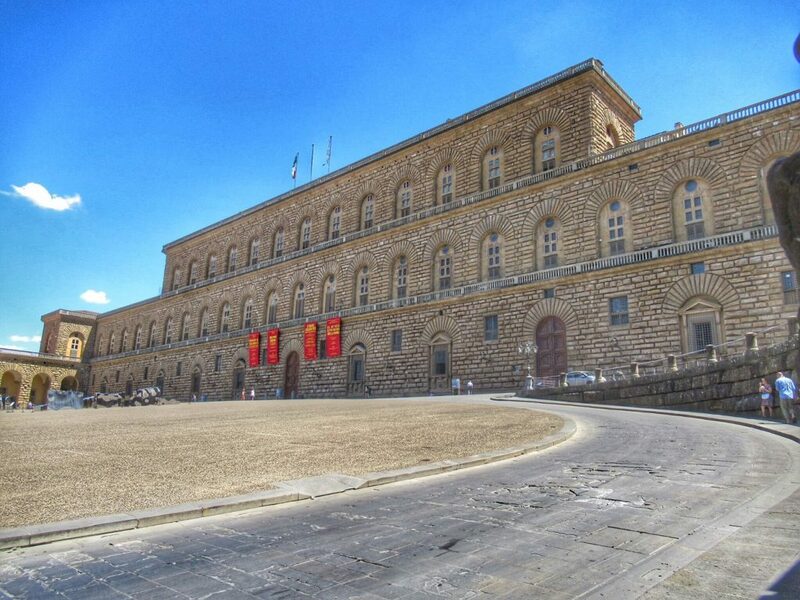 In 1549 Eleonora da Toledo, Cosimo’s wife, purchased the property and it became the Medici’s city residence. You can admire Bronzino’s beautiful portrait of Eleonora at the Uffizi Gallery. The garden was designed as a conceptual continuation of Palazzo Pitti‘s style. The courtyard’s two wings, stretching forward, serve as a link between the Palace and the garden’s landscape. The garden also reflects its aristocratic heart. Conceived as an ideal noble space on the edge of the city across from it, it marked the distance between the 16th-century Medici court and the population at large. The gardens remain separate from the city’s life to this day. They were the site of lavish parties, only open to the court and the Florentine aristocracy. 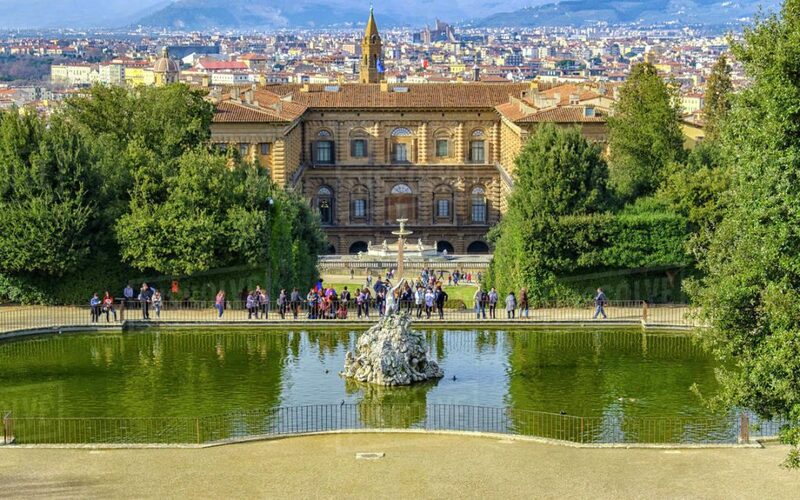 The garden’s hill location affords a gorgeous view of Florence and its surroundings, and its lush plant life, grottoes, statues, pools, and many fountains join to create a picturesque atmosphere in perfect accord with Florence’s city layout. The garden was designed by Niccolò Tribolo who surely can be credited with the idea of excavating the hill to make the gardens. A staircase connects the courtyard designed by Ammannati with an upper flat area, where the amphitheatre spreads. The Fountain of the Ocean was originally in the center of the field but was later moved to the garden’s western part so the amphitheater could be used as a venue for performances. Designed by Giambologna in 1576, the fountain is made up of a marble group depicting the Ocean (the original is in the Bargello, having been replaced by a copy), and three reclining river gods represent the Nile, the Ganges, and the Euphrates. The structure is raised on a large marble basin supported by a large pedestal. The lovely seated figures of the Rivers require viewers to walk around it to appreciate every carefully-crafted detail. 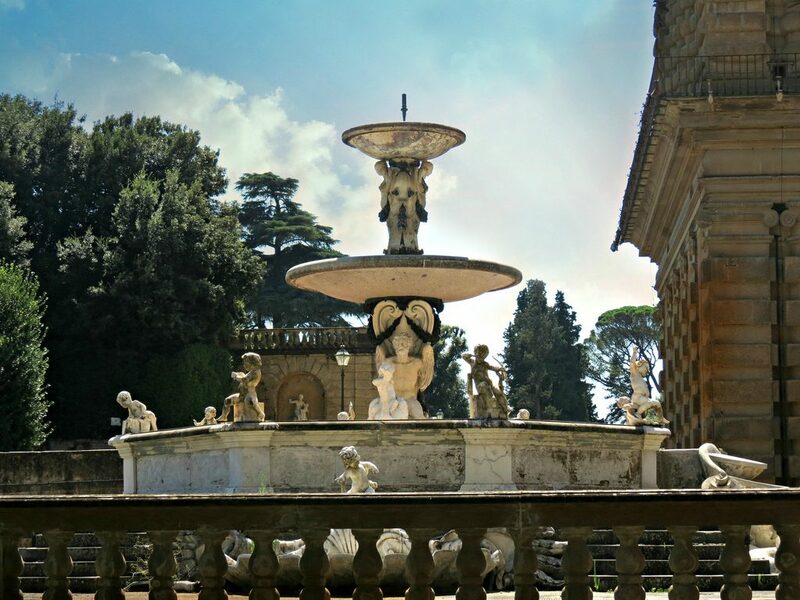 From this central point, there’s a beautiful view of the back of the palace, further embellished by the terrace where the Fountain of the Artichoke is set, sculpted by Francesco Susini and Francesco del Tadda. It was placed here in 1641, replacing another fountain called Juno. The name “artichoke” likely comes from the similarity between the leaves on the artichoke stems and the decorations of the shell valves with cherubs on the side of the stairs where the octagonal basin is supported. A marble cherub is on every corner of the basin, taking carefree, cheerful poses, and another two cherubs are astride the fish above the side shells. Heading towards the northwest corner, we come upon the Fountain of Bacchus depicting the dwarf Morgante, court jester of Cosimo I de’ Medici. Braccio di Bartolo was one of five jesters at Cosimo I de’ Medici‘s court. Born with dwarfism, due to the era’s ignorance and insensitivity, he was made to do humiliating acts to amuse the courtiers, such as fighting monkeys and other animals. He was ironically nicknamed Morgante because. after the giant featured in a popular poem of the era of the same name by Luigi Pulci (1432–1484). But Braccio-Morgante was an intelligent, cultured, and skilled man. He soon gained the Grand Duke’s recognition, and he chose him as a personal adviser and gave him many privileges. To ingratiate themselves to Cosimo I, the court artists started to portray him in their works. 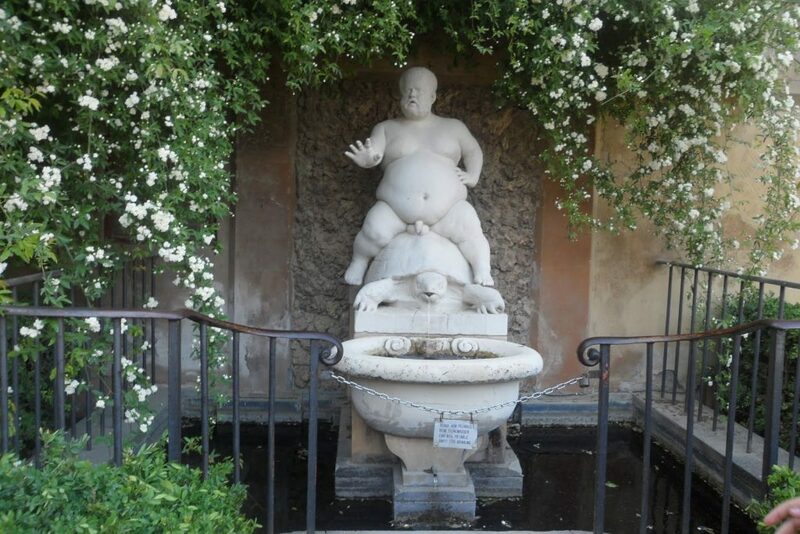 The white marble sculpture depicts him in the guise of a Bacchus astride a turtle with water pouring from its mouth. Valerio Cioli sculpted it in 1560 by; it is now replaced by a copy. Continuing down the magnolia-lined paths, next we can admire the Grotta del Buontalenti, full of odd, unexpected forms, fruit of Buontalenti’s supple imagination. The grotto is divided into three areas. 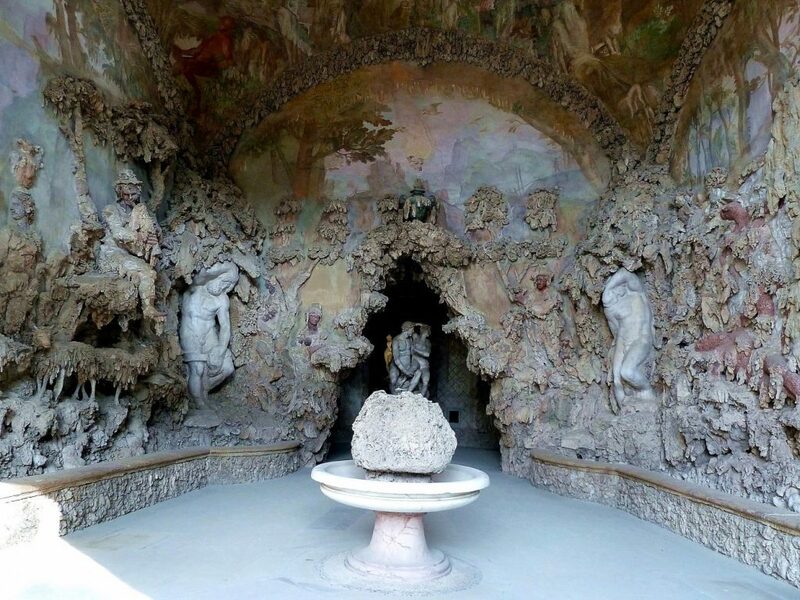 The third area is frescoed with plant motifs and has inside a small fountain by Giambologna, depicting Venus on a rock in the act of getting out of a bath and being threatened by four satyrs. 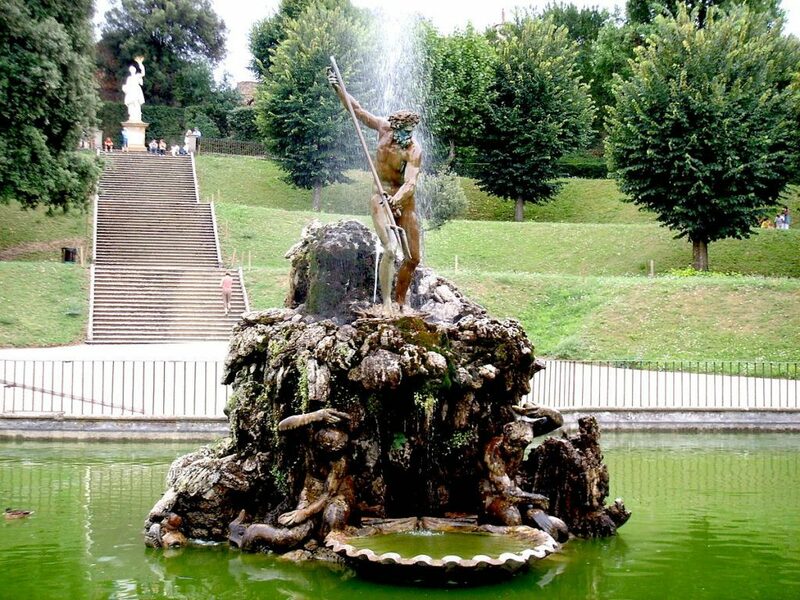 Going further, we come to a large flat area, largely covered by the Fountain of Neptune, also known as the Forcone, made by Stoldo Lorenzi between 1565 and 1568. It has a large basin in the center of which is a rock with mermaids and Tritons with the figure of Neptune looming over them in the midst of striking the Trident. Coming to the Rococo Pavilion of the Kaffeehaus, we get to a sloping lawn from which to enjoy a gorgeous view of Florence. In the middle of the lawn is the Fountain of Ganymede. The original 17th-century marble group has been replaced by a cast. At the top of this path, sloping southwards, the city wall marking its border, is The Knight’s Garden, one of Boboli’s fenced gardens. In the center is the 16th/17th-century Fountain of the Monkeys. The fountain, with a central marble cherub, was named for the three bronze monkeys at its base. For a stroll amidst these magnificent fountains to enjoy the Boboli Gardens’ wonderful landscape, book your skip-the-line ticket right away! 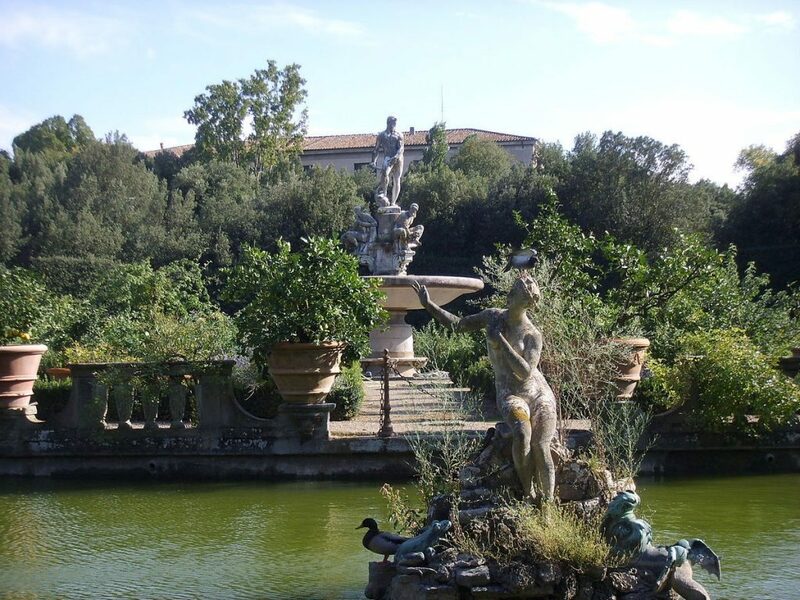 In this post we have talked a lot about the beautiful fountains you can admire visiting Boboli Gardens in Florence. If you are fond of fountains we suggest you to read our post on Rome Best Fountains as well.